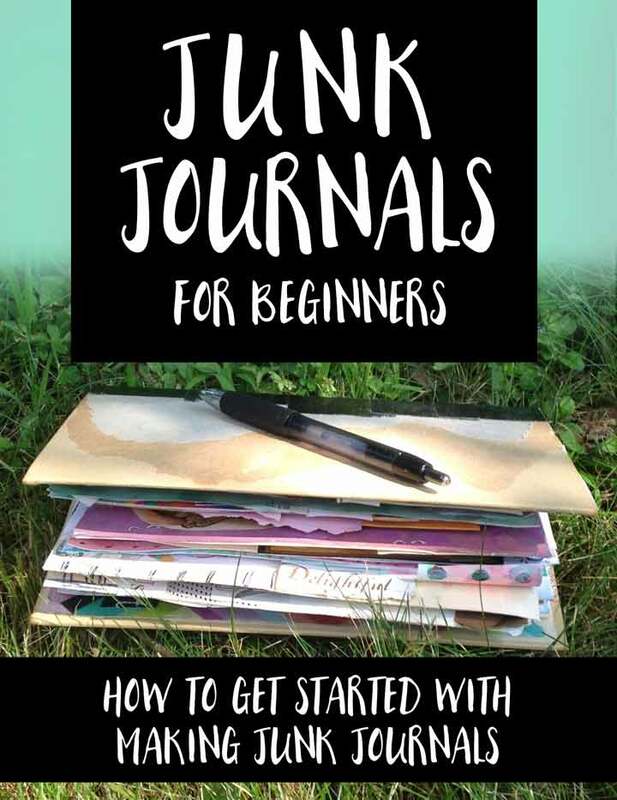 In order to give junk journaling it’s proper due, this post today will dive in deep on everything you ever wanted to know about junk journaling for beginners. 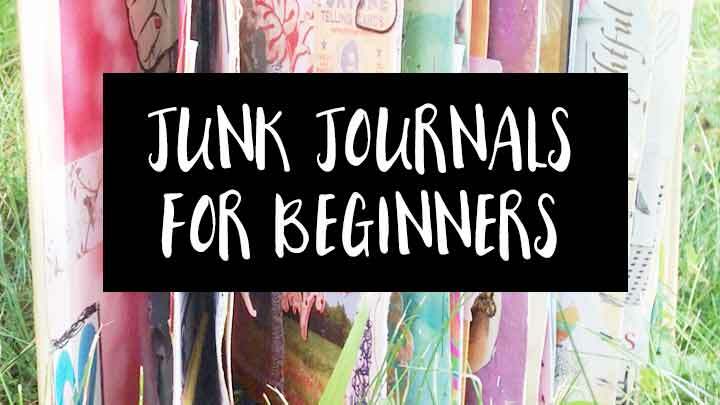 First Things First: What is a Junk Journal? Like art journaling, there is no “one size fits all” definition for what a junk journal really is. Junk journals can vary from person to person, but it generally most of them do share one primary characteristic: The journal is made with mostly a mix of found and recycled materials. Now, what the journal is used for and the purpose of the junk journal itself of course will vary greatly from person to person! Many people will even call it a junk journal because it is a mash-up of all the “junk of life”, which we talked a little bit about in my post on the Junk-to-Joy Gratitude journals. 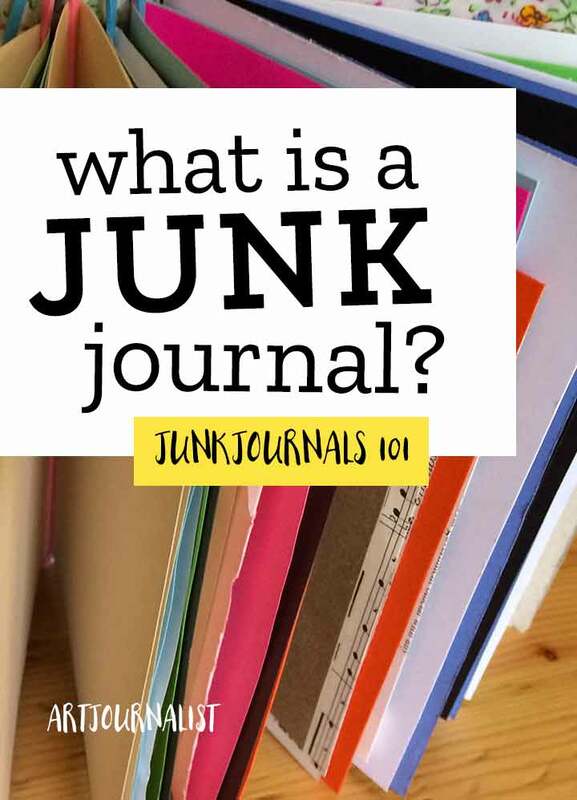 For some people, myself included, a junk journal is sort of like that junk drawer in your kitchen – it has a little bit of everything and anything! Of course, finding an “official definition” is not completely possible, since it is not in the dictionary of course, but I’ve tried my best to get a definition that sums it up as clearly in one sentence as possible. 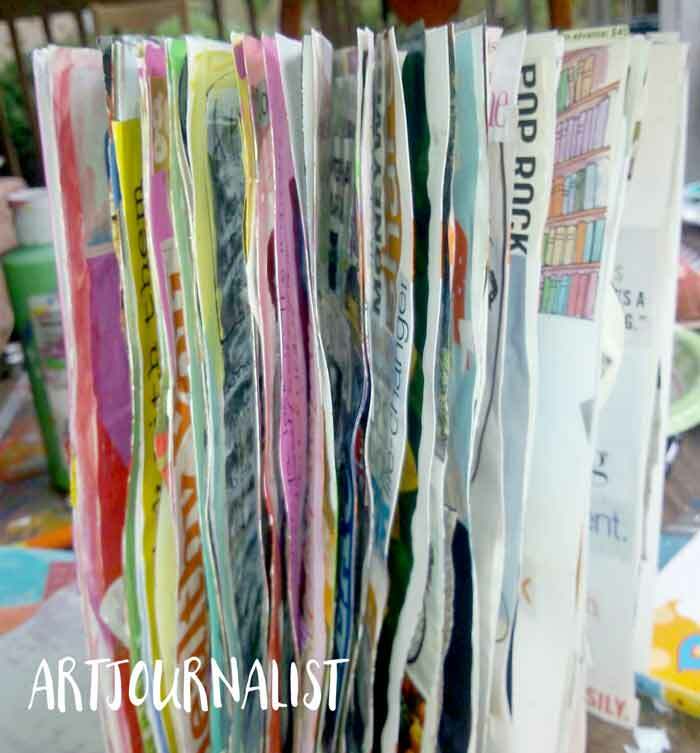 Junk Journal: A book which is often made through found and recycled materials to be used as a way to collect and record memories, thoughts, ideas, and inspiration. This is a little bit of a generic way to sum it all up of course, but I think it does explain it clearly for those who may have no idea what a junk journal might be. This is the general definition I use when I try to explain a million times the differences between scrapbooking, art journaling, junk journals and planners to the non-crafty people in my life. Since a junk journal is a mash-up of all sorts of things, naturally everyone uses their journal differently and enjoys their own unique process in creating it. If you are curious for some ideas on ways to use a junk journal, there are lots of great ways to make it work for you. An everyday journal is just what it sounds like – it’s a journal you use for the everyday stuff of life. It’s one of those journals where pretty much everything and anything might end up in it. You can also collect and display ephemera from the daily things you do – maybe a sleeve from that cup of coffee you enjoyed with a friend or a tag from something you bought. These types of junk journals are a great way to remember different things from life. It’s a fun way to document and remember all those little moments that make life big. In a way, it sort of becomes a daily scrapbook for many people, but of course you can always include things like written journaling, notes or to-do lists. Another great way to use a junk journal? As a planner! I am one of those people who is always has my brain in “to-do list mode”. I also tend to LOVE all the little planner-craze stickers and washi tape and papers – so it is really a win-win to use a junk journal in this way because it feeds my stationary-paper-sticker-obsessed part of self. You can choose whether to keep the journal in calendar format, or just make it a fun way to explore ideas and keep track of projects you are working on. A memory book is a book that showcases the life and memories of a person. This is a great way to use and display personal paper ephemera like birthday cards, anniversary cards, ticket stubs, etc. Yesterday we were going through some old things in our garage when we stumbled across an entire box of these things from my husband’s late grandmother he had been saving for almost a decade now. It had a lot of cute old vintage cards, paper scraps from when they traveled, receipts from things they bought, stuff like that. We didn’t even know this box existed, but since stumbling upon it I am definitely planning on making a pretty book to display these things. Having all those little scraps of her life in the garage collecting dust certainly does not do any of these things from her life justice. By making a junk journal memory book, we can have a nice book that can be shared with the whole family as a special way to remember his grandma. And once I get the first one done, I will definitely be doing this with my parents. Junk journals make for a super personalized and creative gift to give to someone, especially for those sentimental types of moments like holidays, graduations, weddings, anniversaries – but even just for fun. Of course, this relies on the recipient understanding and appreciating the journal – but it definitely can be a great idea. For example, a few Christmases ago I made a holiday junk journal for my mother-in-law who is also an artist and somewhat of a paper collector like me. It makes me so happy every Christmas to see she’s added more and more to it each year. Another great way to do these junk journals is to give them a specific theme. 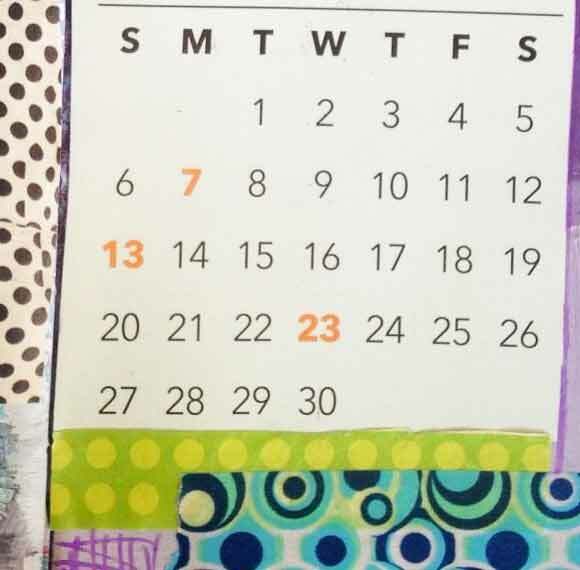 If you look at our art journal theme ideas list there are tons of ways you can make a book have different subjects or surround a central theme. For example, you could make one that is all things flowers and gardening, or make one that has a theme from a certain story or book like Alice in Wonderland. These themed journals can be a ton of fun to go through and see all the different little things. Of course, these are just a couple of ideas. 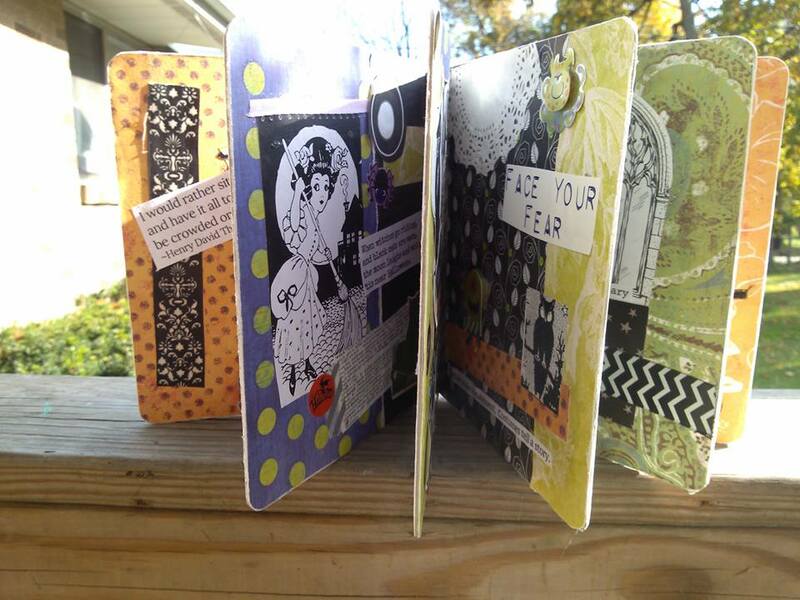 You can do anything in a junk journal, just like you would with an art journal. 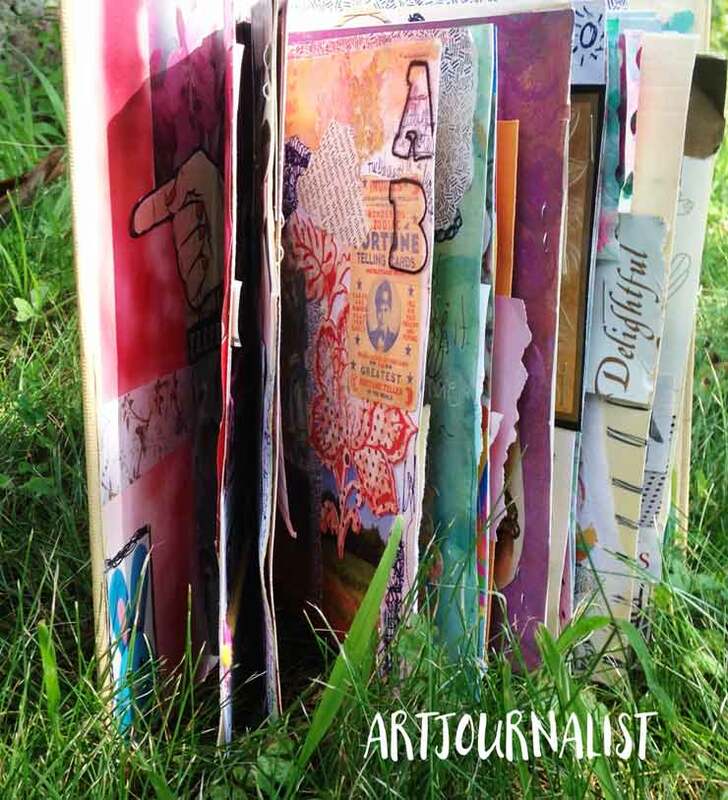 In fact, you can even use a junk journal as an art journal! I love creating mixed media junk journals as an art journal. It’s all the more fun for me to combine tons of different paper scraps and ephemera with my favorite mixed media supplies like acrylic paints, gesso, watercolors and more. Many of my junk journals are also part art journal. I love using those “messed up art pages” as a base for new pages in a new journal. Hopefully I will have a chance to update this with a full video tutorial for how to make a junk journal in these next few weeks. For now I will go through the basic steps of everything you need to do to get started! You don’t have to have a specific theme, but it does help to sort of decide what purpose the journal will serve when you first start. This gives you a little bit of a place to focus. I think one of the big reasons a lot of people don’t jump right into junk journaling is because it is sort of overwhelming with everything all at once! Having a focus can help narrow down the overwhelming choices. For example, if you pick a theme like “flowers” you can easily put together everything that is flower and garden related. You don’t have to start with a super specific focus at first. Don’t worry, the purpose can be general: “To mash-up whatever paper ephemera I happen to find in this box” – or it can be very specific “To do something with all those papers of my grandparents in the attic”. 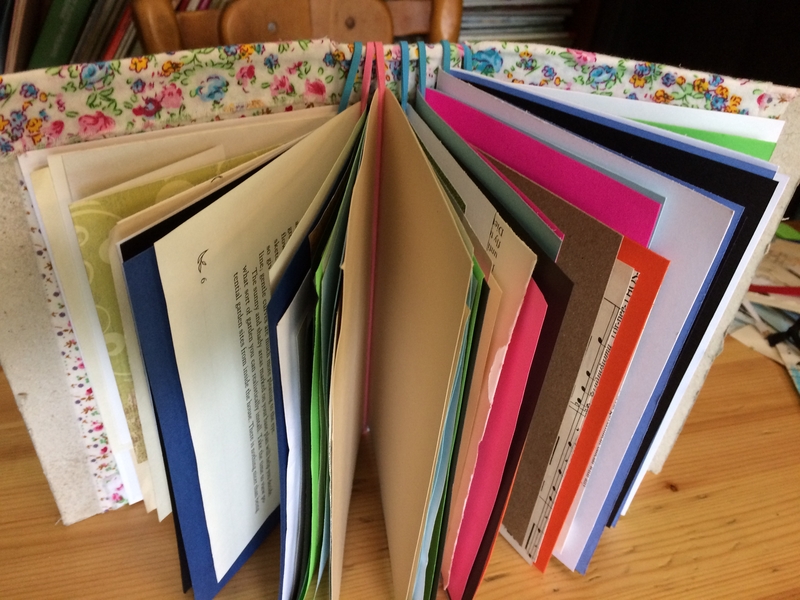 There are TONS of great book binding methods for making a junk journal. There are basically four methods that are most popular. Sewn Book Binding: With sewn binding, you will actually be stitching the papers into the cover of the journal. There are many, many different sewn binding techniques and ways to stitch in the papers. You can see how we make a junk journal using a simple pamphlet stitch in our Upcycled Blue Jean Journal Tutorial. Binder Rings Method: This is a very beginner-friendly way of binding a book together. 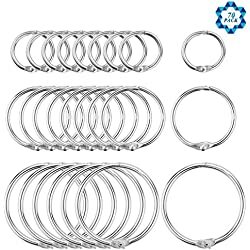 For this method, all you need are a few binder rings and a good hole punch. Punch holes in the paper, insert the binder rings and you are ready to go. My No-Sew Elusive Perfect Journal Method: I don’t really know if this method has an official name, but it is similar to Midori traveler’s notebooks. You can see an example of it shown above. It is super simple, you can reposition all of the pages, and no sewing or hole punching is necessary. This is why I call it the “elusive perfect journal” – and you can view the full junk journal binding tutorial with video here. Altered Book Method: The last method is to simply use a notebook or book that already exists and alter it to work as your junk journal. This takes a little prep work, but definitely is a viable option, especially if you don’t really want to get into binding your own journal. You can use any kind of journal, book or notebook as a base – and then just fill it up with whatever types of things you want! I have a small obsession with composition notebooks, but of course you can use anything. If you are using an old book and might paint in it, you may also want to check out our tips for how to alter a book. The good news? You can try all of these methods with multiple journals. Just pick one which sounds like the most fun or one you can do easily right away and start! The best part about junk journaling is you really don’t have to buy a single art supply to make one. 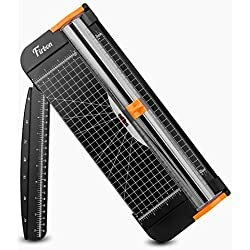 Of course, you can always invest in some great tools like a paper cutter or basic bookbinding kit, but there are plenty of ways to make do with what you already have. In fact, I would even argue stretching your creativity with what you already have is all part of the fun! Paper Ephemera of Any Type: See our Junk Journal Supplies List and go on a scavenger hunt around your house! Make a big pile. 🙂 And of course, if you need ideas for ways to organize all that paper ephemera, we’ve got you covered on that one, too. 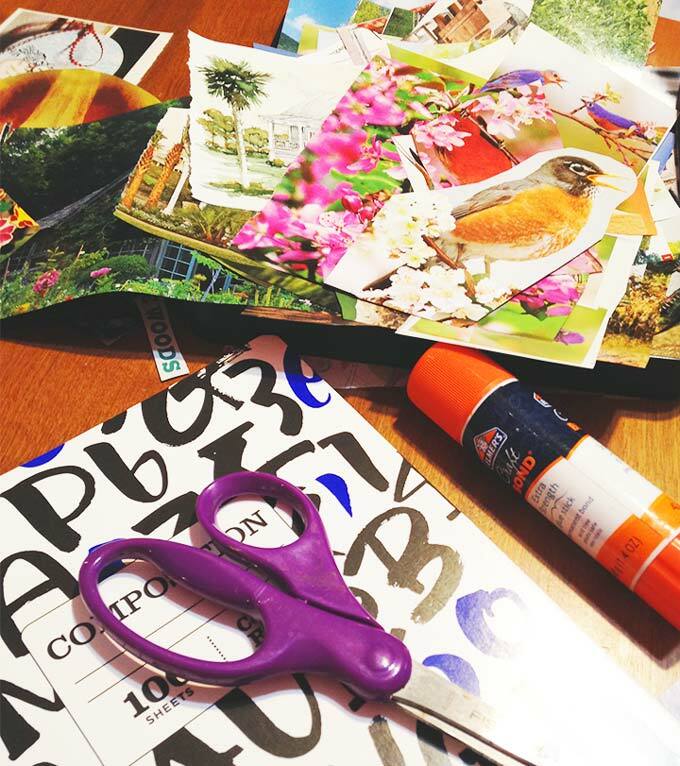 See how I organize my collage supplies for some practical tips and the voice of experience sharing wisdom on why you should not make 10,000 piles of paper all over your bed, ha. This step will largely depend on the method of book binding you choose. If you will be making your own journal, this step will mean preparing a cover and cutting down the base papers. If you are using binder rings, you’ll likely want to punch some holes into the papers at this step, or if you are sewing the pages together this is where you would do that. If you’re already starting with a journal or existing book as the base, in this step you will probably want to do some basic prep work, like removing pages if necessary or adding bookbinding tape to reinforce the binding. Step 5: Fill That Journal Up! Every part of this process is fun for me, but this is where the real magic starts to happen! This is the step where you begin to fill up all of the pages with the different ephemera and items you’ve collected. Some people like to keep their pages very organized, almost like a grid style of layout – while others simply just follow their mood and intuition and do whatever feels right. It’s completely up to you the types of layouts and designs you create within the pages, but one thing is for certain: Pile on those layers! Layering is what gives each page a lot of interest and depth. In general when layering I like to start with large items first, and then begin to add in the medium and smaller in pieces. You can also accentuate almost any page with different things like stickers, stamps, ribbons, lace, old costume jewelry charms, etc. If it’s flat, it can fit into a journal! While the concept of “glue in some pictures to a piece of paper” is pretty basic and simple, there are also a TON of different techniques you can explore in making these books. Basically it’s a junk journal – so there are no rules and have fun with it! Here I will go over some different techniques that help add that wow-factor. I love pockets, because it is a great way to give the book some special hidden elements. You can make pockets in all sorts of ways, such as with envelopes, tags, etc. If I’m making the junk journal as a gift for someone, I love to add in these pockets and put in little trinkets inside. This could be things like hot chocolate packets, gourmet tea, etc. – or heck, even an actual gift card – just make sure you recipient knows it’s there to use and enjoy! Not every piece of paper needs to be the exact same size and shape. Layer with different smaller pieces of paper, or even use papers that have crazy shapes. This again just builds on the depth and interest in the book. For my Type-A personality friends, the different sizes and shapes of paper can be maddening to them. It’s okay if you have the majority of pages the same size – but don’t get caught up on trying to trim every single paper into these perfectly identical rectangles. Embrace the imperfection and know that is part of the process and is what gives each and every journal it’s own special touch. Stamps can be used in tons of fun ways in the journal. You can use image stamps on blank papers or you can just use the ink pads themselves to add some color to the edges of the pages. If you already have stamps, great, use those – DO NOT BUY ANY MORE STAMPS. Hopefully you already have stamps, but if you don’t, the best way to buy them is used. Most of my stamps were bought used, so while they are a little beat up they work for me! 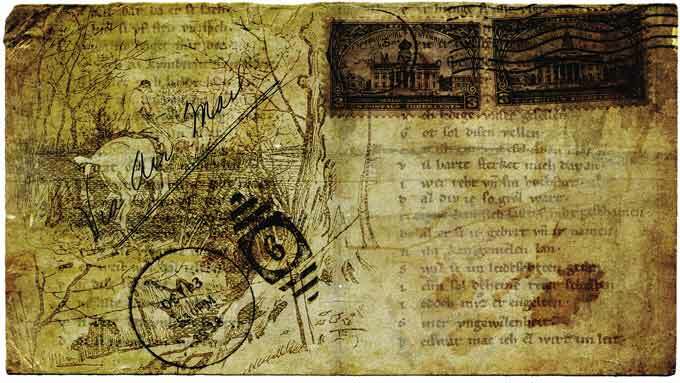 While you can get away with used stamps, fresh ink is typically usually a must. For ink, I love distress inks like this set of minis from Tim Holtz. And of course, if you watch for sales, there’s tons of great rubber stamp sets on Amazon. Don’t discount the kid’s stamps sets either. That’s a great way to get a lot of nice images without breaking the bank. 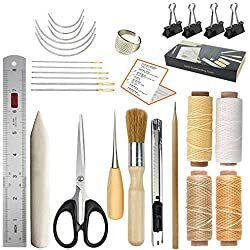 It’s also sometimes helpful to check out the daily deals section for arts and crafts supplies on Amazon – I’ve found some pretty neat things that way. For this reason, it’s always a good idea to add in some things that give it a little personality. If you love something and it makes you happy or reminds you of something happy, you should do it. Don’t keep something out of a journal just because it’s not “expected” or “doesn’t make sense to everybody”. If this means you smash up a picture of Snoopy with the Queen of England, because it reminds you of that one time you were watching a Peanuts marathon with a friend from Britain and that makes you happy to think of that memory, just do it. While a junk journal often uses recycled and found materials, it is 100% OK to print stuff out if it perfectly fits your theme or focus for the journal. You can type up quotes, print out photos of your own, or even find free public domain photos like the one shown above to use in your journals. Also, earlier this year we got one of those Epson Eco-Tank inkjet printers, and it has been a game changer for us for printing things out. While I would still very much love a color laser jet printer, the advantage of the Eco-Tank printer is you don’t have to buy or refill ink all the time. 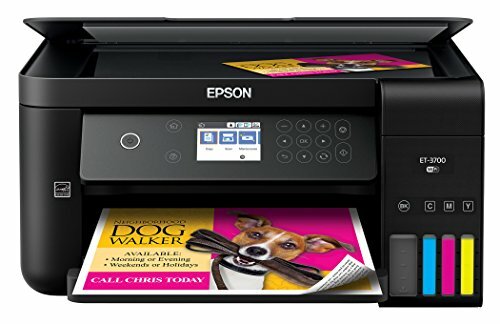 The printer we have is the Epson EcoTank 3700. It’s awesome. I love it. It’s still going strong. I can print 11,200 pages before I even have to think about changing the ink – and the ink is very, very economical as well. Includes enough ink to print up to 14,000 pages black/11,200 color (2) - equivalent to about 30 ink cartridge sets (3). Load paper less often - 150-sheet paper capacity. Large 2.4" color LCD - easy setup and navigation. Of course, you don’t have to buy a printer just for junk journaling. I just couldn’t take it anymore spending $100 or more every few months for ink. This printer eliminates that problem, because even when it is time to refill 11,200 pages later it is still cheaper than what I was paying for other standard printer ink cartridges. Maybe there are some junk journal purists out there who don’t agree, but I figure $40 to print out 11,200 pages is a lot more eco-friendly and budget friendly than buying anything new. 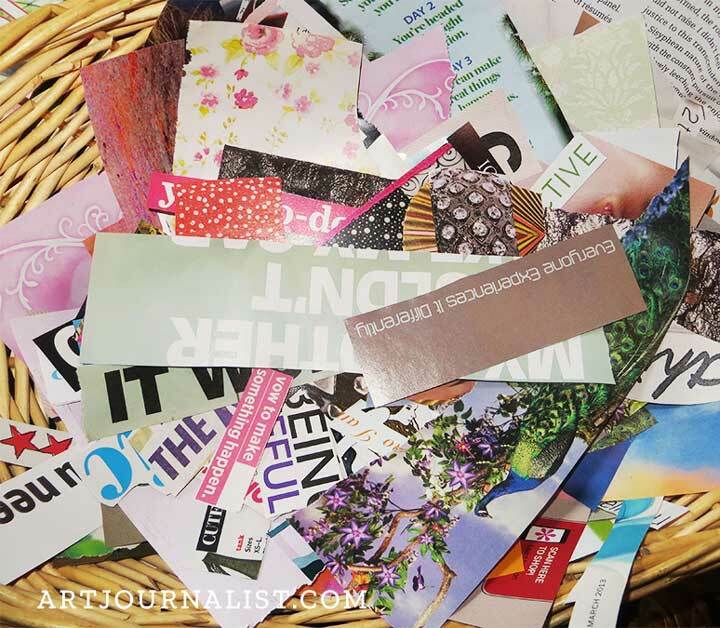 I see printing out images as a perfect way to use what I have – a super economical and powerful printer – as part of the creative junk journal process. Another thing I think that really brings a lot of dimension and fun into junk journals is adding in little details like tabs, paper clips, book marks, and more. At any rate, it’s nice to have some variety in the different ways you can add things in. Don’t limit yourself to just using a glue stick! When it comes to making junk journals, there are some fantastic books and online classes. Craftsy BluPrint: Think of this like the Netflix for artists and crafters. It’s really an amazing resource and there is so much inspiration to be found. They have tons of videos on painting, scrapbooking, journaling – but also lots of other things also, like cooking and fiber arts. Stash & Smash: This book by Cindy Shepherd is such a fun book, and even if you are experienced and know a lot of the techniques already, it’s such a fun and beautiful book to look through. Bound by Erica Ekrem: This a book that goes over the basics for some popular bookbinding techniques. I like the book has some nice diagrams for references, especially if there’s a specific type of binding you want to do but can’t remember the exact stitching steps. If you are a beginner, you may need to supplement with a video, especially if you are more of a kinesthetic style type of learner. What do I do if I don’t have any pictures or receipts, stubs, etc. I don’t save stuff like that and the only pictures I have are family that I don’t want to give up. Hi you can ask friends and family for their junk mail, that’s what I’m going to do. Also, if you have photos, you can copy them instead of using the originals. I also found that you can google images of things that you want and then print them off. Thank you Maria, it definitely is always exciting to discover there others who are interested in creating! Thank you Karen, glad you found it helpful! Thank you so much for all of the great information. I will definitely be attempting to create a junk journal. You’re welcome Sherry, glad you find it helpful! Thanks for all the great advice and excellent ideas! You’re welcome Judy! If you have any questions just ask! This is a first for me ! I have tried regular journaling but I just can’t get into writing only words….I need color, photos, prints etc. I will definitely try this once I finish my move. Returning to the States after 47 years abroad. Now I wish I had saved more ! Thank you , I enjoyed reading your post.